This contact play is a normal measure taken against the 4463 enclosure. 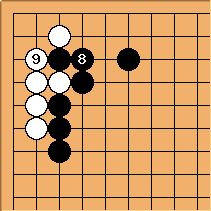 Since the 3-3 invasion typically becomes ko, is a simpler approach to take, though it means that Black can take a solid corner if he so chooses. In pro games, Black next at a to confine White to the corner is somewhat more popular than Black at b, to defend the corner territory and allow White room on the left side. 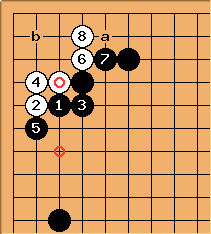 I find this variation once by Ma Xiaochun (winning) against Yoo Chang Hyuk in the Samsung Cup 2001, and by Nakamura Hidehito (losing) against Kono Rin in the 2007 Meijin Preliminary. 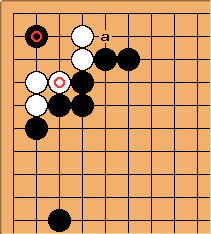 In both cases there are other stones in the proximity - reducing the influence of the possible black wall reached by variation b.
tapir: Example from pro play, white has only 1,5 eyes locally. tapir: this last one is simplified, that is decontextualized... please add scholarship here. tapir: please take notice of the fact, that in all lines given until now, it is black to chose between taking outside influence or keeping the corner and the option to keep the corner is available even after the outside hane. 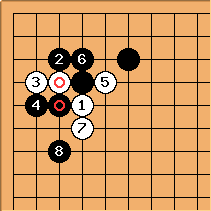 tapir: After the crosscut I can only find one stable (played more than once) line in my small database. Please help! 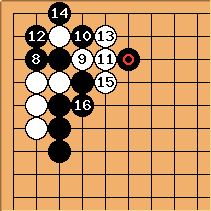 Dieter: Such a crosscut is never played in isolation but as an emergency tactic with other, more important stones involved. Two pro games had this much space around the crosscut, once as a ko threat and once as a ladder breaker so the context was even bigger! 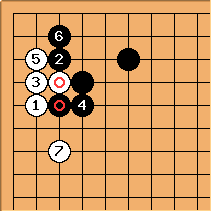 Here is one possible continuation for the inside hane. 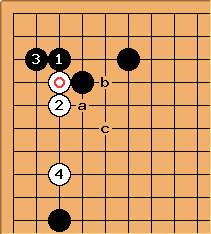 Sometimes, White may exchange a for b before extending to 4, or White may play directly at c instead of 4 to get a lighter shape. It all depends on the surrounding stones. There are many variations here, Here are some of the more common ones. 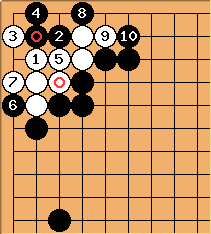 Usually, White plays the contact play to invade after Black has extended along the side. Otherwise, another approach is usually more appropriate. 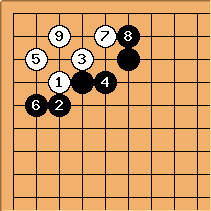 Here is one possible continuation for the outside hane. 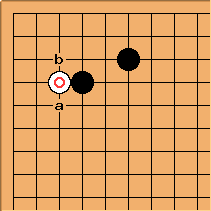 If Black plays at a, White will usually respond at b to secure the corner. 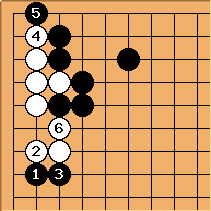 tderz Black will rather start with b to threaten to initiate a ko (esp. 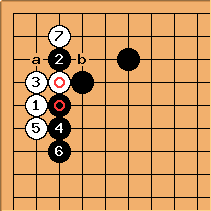 if is occupied by a ). Is it not better for Black to confine White to the corner for influence, especially if he has side extensions to his orginal 4-4 6-3 corner enclosure? tapir: What is this? Looks so strange and small. The professionals play (in my database invariably two lines, after , , ), s. Counter hane. 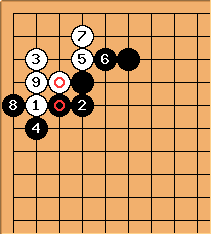 Yes I saw this in either enclosure joskies or ishida's joseki dictionary and I think it's outdated.